This page has many photos of 100% natural garnet jewelry items, so it will load more slowly! It contains photos of jewelry items in all of the garnet varieties including almandine garnet, color change garnet, hessonite garnet jewelry, mandarin spessartite garnet jewelry, rhodolite garnet and tsavorite garnet. This 14k yellow gold pendant is set with a 2.26 carat spessartite garnet gemstone with very rich medium-dark orange natural color - this gemstone is unheated and untreated. See also a side view of this dark orange spessartite garnet pendant. This beautiful spessartite gem has very good brilliance that looks like fire in its depths! This lightly included gem faces up eye clean, with faint natural inclusions only visible under close inspection with bright illumination. This beautiful gem was faceted from a natural spessartite garnet crystal that was discovered in Nigeria. This 14k yellow gold pendant is set with a 2.33 carat spessartite garnet gemstone with very rich medium-dark orange color with reddish-orange hues (100% natural color -this gemstone is unheated and untreated). See a side view of this dark orange spessartite garnet pendant. This beautiful spessartite gem has very good brilliance that looks like fire in its depths! This lightly included gem faces up eye clean, with faint natural inclusions only visible under close inspection with bright illumination. See another view of this beautiful spessartite garnet jewelry design. This wonderful gem was faceted from a natural spessartite garnet crystal that was discovered in Nigeria. This 14k yellow gold ring was hand-crafted and set with a fine nigerian orange color trillion cut spessartite garnet gem (100% natural color; this gemstone is unheated and untreated), and with three natural color, round cut tsavorites weighing 0.25 carat total tsavorite weight. The fine quality orange color spessartite garnet in this ring weighs 2.41 carats, and it faces up eye-clean to the un-aided eye, with small blemishes visible only with very close inspection with magnification. The tsavorites are completely eye clean. The photo at left was taken under a mix of bulb and fluorescent light. These beautiful green and orange garnet gems were very well faceted with excellent brilliance. See also a side view photo. See also a top view photo. See also a another top view photo. Spessartite garnet gem weighs 3.72 carats, diam. 0.11carat. 10x8mm faceted oval spessartite and 3mm round diam. This 14k yellow gold pendant was set with a 3.72 carat oval spessartite garnet gemstone with very bright fine Nigerian orange color (100% natural color; this gemstone is unheated and untreated). This fine quality spessartite garnet gem has fine very slightly brownish orange color. It is eye clean with faint natural inclusions that are only visible under very close inspection with magnification. This beautiful mandarin orange garnet gem was very well faceted with good brilliance. This gem is accented with a natural color brown orange round brilliant cut diamond of 0.11 carat weight. See also a side-angle view photo. This 14k white gold mandarin garnet ring is set with a fine mandarin orange color spessartite garnet gem (100% natural color - this gemstone is unheated and untreated). This beautiful 14k white gold ring is also set with two natural white diamonds weighing 0.23 carats total diamond weight. The fine quality natural mandarin orange color garnet in this ring weighs 1.55 carats, and it is completely eye clean. The photo at left was taken under incandescent light. This wonderful mandarin orange garnet gem was very well faceted with excellent brilliance. Natural spessartite garnet necklace with 148 carats of transparent spessartite beads! This natural spessartite garnet necklace was hand-crafted from natural color reddish-brownish spessartite garnets that were mined in Mozambique. These superior quality spessartite garnets are lightly included to eye-clean! They were shaped into rounded, disk shaped beads which were then polished, drilled and strung into this beautiful 18" long mandarin garnet necklace with a 2 inch sterling silver extender chain & clasp. See also a full view photo of this beautiful spessartite garnet necklace. We have this fine quality spessartite garnet necklace available with gradational size beads ranging from 5mm at the clasp up to 6mm at the largest diameter in the center of the necklace, and then back down to 5mm again, with 148 carats total weight of natural gem-grade spessartite garnet beads! Set with seventeen rhodolite garnet gems weighing just over 9 carats total weight! This 925 sterling silver bracelet is set with 17 natural rhodolite garnet faceted gemstones. 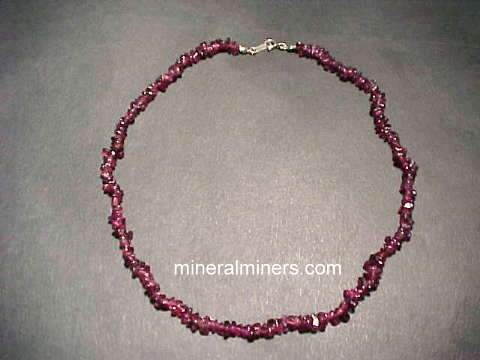 The beautiful 6x4mm gems in this rhodolite garnet bracelet face up clean. These lovely rhodolite gems have a refractive index of 1.76 with completely natural red-purple color - they are unheated and untreated. See also a full view photo of this genuine rhodolite garnet bracelet. This 14k white gold pendant is set with a natural rhodolite garnet gem. The beautiful gem in this rhodolite garnet pendant faces up clean with faint natural inclusions only visible under close inspection with bright illumination. This lovely rhodolite gem has completely natural red-purple color - it is unheated and untreated. This 14k yellow gold pendant is set with a checkerboard oval faceted rhodolite garnet gem. The superior quality gem in this beautiful rhodolite garnet pendant is eye clean. This lovely rhodolite gem is very well cut, and it has fine dark red-purple natural color. See another view of this genuine rhodolite garnet pendant. This gemstone was cut from a natural color rhodolite garnet crystal that was mined in Tanzania. This eye clean rhodolite gem has a refractive index of 1.75. The color of this eye clean rhodolite gemstone is completely natural with no heating and no treatments of any kind. This 14k yellow gold pendant is set with a 7.6 x 5.1mm round (briliant) faceted rhodolite garnet gem. The beautiful gem in this rhodolite garnet pendant faces up clean with no visible inclusions to the un-aided eye. This lovely rhodolite gem is very well cut with superior brilliance, and it has completely natural red-purple color - it is unheated and untreated. This 14k yellow gold ring was custom set in a bezel style with a natural color medium dark tone slightly purplish red Rhodolite gem weighing 7.46 carats. This fine quality rhodolite garnet gem has fine (100% natural color: it is unheated and untreated). It is completely eye clean (GIA: Type II, Clarity Grade: flawless), and it was well faceted with good brilliance. This uvarovite green garnet jewelry pendant was handcrafted in sterling silver and set with a 32x20mm free form cabochon gem of natural color green drusy uvarovite garnet crystals on matrix. This uvarovite green garnet jewelry pendant was handcrafted in sterling silver and set with a 30x16mm free form cabochon gem of natural color green drusy uvarovite garnet crystals on matrix. This extra large size uvarovite green garnet jewelry pendant was handcrafted in sterling silver and set with a 55x23mm free form cabochon gem of natural color green drusy uvarovite garnet crystals on matrix. This extra large size uvarovite green garnet jewelry pendant was handcrafted in sterling silver and set with a 50x27mm free form cabochon gem of natural color green drusy uvarovite garnet crystals on matrix. This is the end of our Garnet Jewelry virtual gallery page. 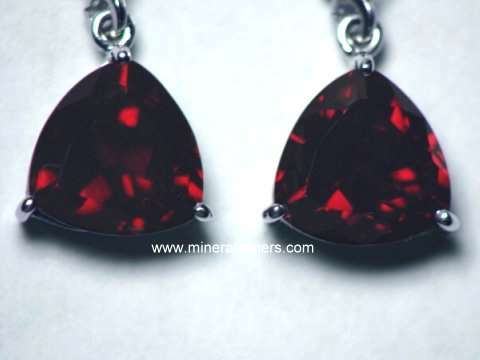 Would you like us to inform you when we add on this page more natural garnet Jewelry? We do have additional inventory of natural garnet items in stock, so be sure to let us know if you have any natural garnet jewelry special requests. Please contact our webmaster or our 'site' geologist with any questions or comments.